6.5 x 13.5 x 2.5"; 20 panels. Accordion structure. In a Kyoto cemetery, mourners leave signs of their visit and nature embellishes those signs. 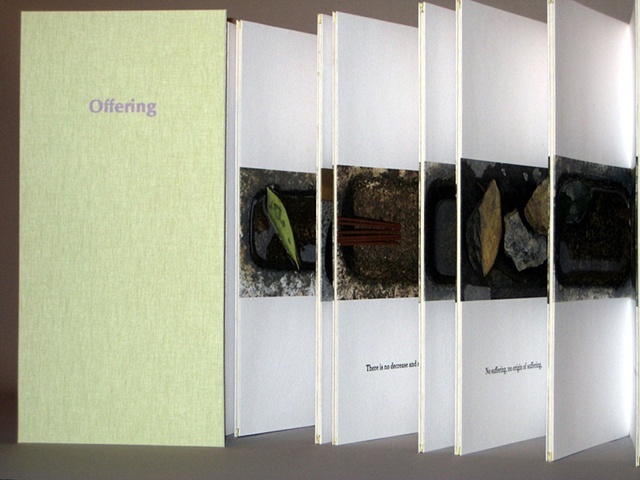 Offering combines Bodoni letterpress and digital printing with an Epson Stylus Photo 9800, and uses Masa and Thai screen-printed papers. The body of the text was taken from various translations of the Mahayana Buddhist "Heart Sutra."